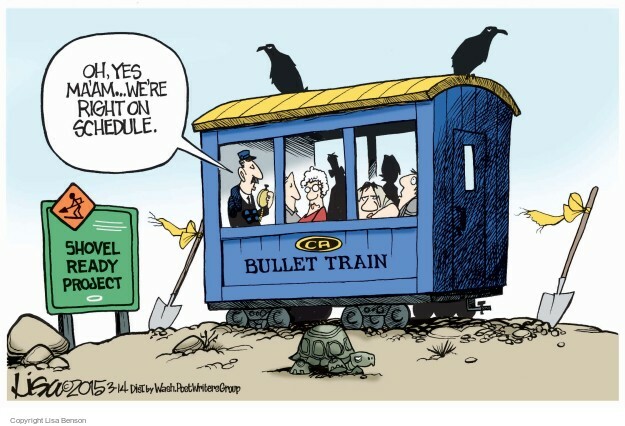 STOP HS2 | HS2 Construction is Two Years Late, No Matter What HS2 Ltd Say. Residents along the route of HS2 have been told that major construction is now only planned to commence in Summer 2019 at the earliest, which according to HS2 Ltds’ own documents, is after much of it was planned to be completed. However, HS2 Ltd staff have refused to accept that this represents any delay to the project, stating ‘this was always the plan’. 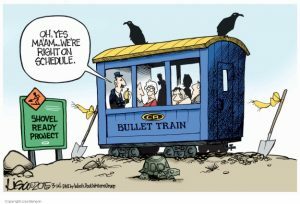 One of the constants throughout the last seven years of planning from HS2 Ltd is the fact that they have never hit a single deadline, whilst at the same time stubbornly refusing to admit the project was behind schedule. Mrs Hodge was of course proved right, with Royal Assent finally coming two years late in February 2017. It should seem straightforward that with Royal Assent being two years late, this would have a knock on effect and the entire project must be late as a result. 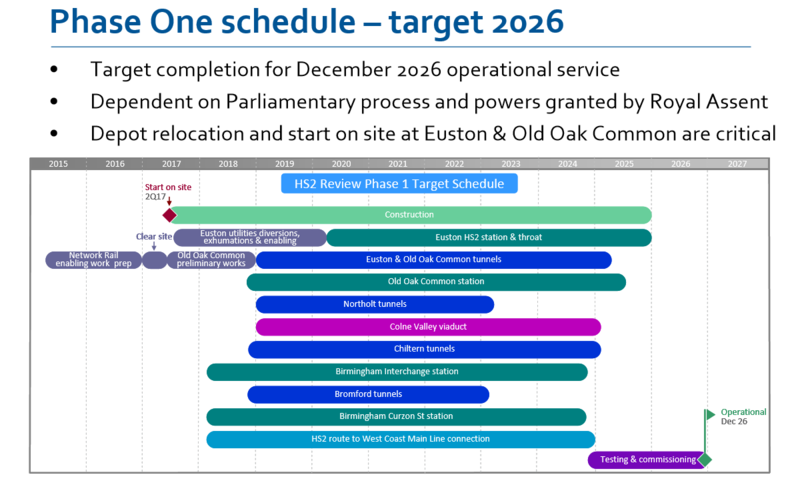 Stop HS2 reported on this potential last year, when it was announced that tendering for building the stations is now planned to start in the first quarter of 2018, the same time that the latest published timetable shows building the two Birmingham stations was to commence. Contracts for installing the rails, gantries, signals etc have also not yet gone out to tender. Last week (Friday 31st March), Attorney General Jeremy Wright MP hosted a meeting in his Kenilworth & Southam constituency for councillors and action group members, attended by representatives of HS2 Ltd Jonathan Lord, Uma Shanker & Stephen Powell, at which the subject of construction timetables came up, the answers to which have route-wide implications. Mr Shanker stated that ground investigation works are currently taking place, and when this is completed there would be a period of ‘a year to a year and a half of detailed design work’, and that ‘big construction’ will start in Summer 2019 at the earliest. This is despite the fact the Gannt Charts detailing construction timetables, which were produced with the environmental statement and used by members of the public had used during the petitioning process in Parliament, clearly show construction in the Kenilworth area as due to start in January 2018. In fact, some of the major works, such as moving the six-lane A46 were originally scheduled to have finished by March 2019, before they are now scheduled to start. Mr Powell repeated the stance that there has been no delay, before admitting Royal Assent was a couple of months late, when in reality it was a couple of years late. He then went on to say that the only place between London and Birmingham where construction could start before Summer 2019 is Chipping Warden, but that would be to build a new bypass, not HS2 itself. In a similar vein, it was revealed that works to improve the A46 at Stoneleigh are to take place before HS2 construction starts, opposed to doing both sets of roadworks at the same time, because HS2 Ltd wish to make use of the improved junction. When construction might start in London was not discussed. Lord did concede that the ‘detailed design work’ both depends on the as yet incomplete ground investigation surveys, and the input of the as yet unappointed construction contractors. The appointment of those contractors was delayed in March in the middle of the conflict of interest row over contractors, and that announcement is now not expected until June at the earliest. for more pragmatic approaches to rail and address current needs more practically with route enhancements not vast long new routes please. PM May is concerned about the local elections and remains silent on your concerns about the HS2 route and costs and what is not being undertaken and provided. Can you find a way this time more than previously to express your concerns in the local voting. Little determination to correct the mistaken route and services has resulted in votes. Can you express your deep concern that you are not being considered sufficiently and were not by being very vocal to the three larger parties please.